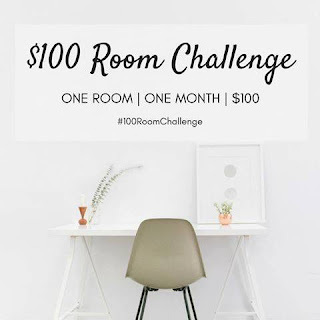 Fun news guys, I'm participating in this season of the $100 Room Challenge! We redid the laundry room for the One Room Challenge this past May and I needed some motivation to get back in the saddle, so this seemed like the perfect opportunity. Erin from Lemons, Lavender, and Laundry started this challenge as a way to encourage people to improve their rooms, even if it's only a little at a time. We post every Wednesday in July and do the big reveal on the last week. You can read more about how she started this challenge on her blog and keep up with it on social media with #100RoomChallenge. For this round I chose to do the half bathroom that is between the master and the guest room. It's a fairly small room that is low on my house renovation list, so I thought it could benefit from a low budget, quick makeover. I got eager and started taping off the black plastic tile so I could paint the green. Not quite sure if I'll leave it white or paint it a color, but next week I'll have a mood board figured out. Today, this is my inspiration picture. Studio McGee is one of my favorite designers and they make a space seems sophisticated with a minimal amount of accessories - which is my goal for the entire house. Hopefully this small makeover will get me one step closer. So tune in next week to catch Week 2 of this challenge, hopefully the walls will be painted! And make sure to check out the rest of the bloggers this week below! I'm sure this challenge will pick up steam and it'll be the biggest challenge around. Studio Mcgee is my favorite too!! That bathroom has so much potential!! Really looking forward to seeing what you do. They're so awesome! Thanks, same for your hallway!! Right?! Thanks Erin! Yeah it's so weird! I love what you are looking to do, its fabulous and that designer has some amazing looks. Can't wait. How does one paint tile. Do you use a special paint? I can't wait to see how you paint that tile! This is going to be a great challenge, and I can't wait to see the result! I've had a similar bathroom and I painted the tiles too! lol Paint is going to help so much. I really like Studio McGee. You have some great inspiration! Great inspiration, I can't wait to see what you do with this space! 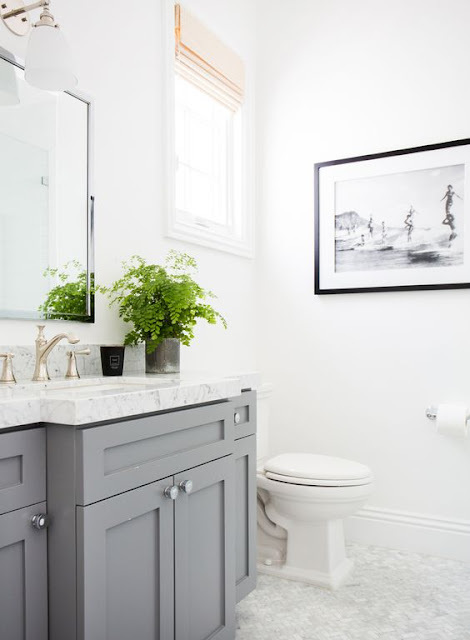 We're in the middle of a few bathroom makeovers, too!